CINCINNATI–Researchers at the University of Cincinnati (UC) have received a $3.2 million grant from the National Institute of Neurological Diseases (NINDS) to study the use of neuroimaging to pinpoint the risk factors of stroke recurrence. Recurring stroke makes up about 25 percent of all stroke cases–nearly 800,000 annually–in the U.S. alone. Someone who has suffered a stroke has an increased risk of a recurring stroke for up to five years after the initial event. “Compared to our understanding of the risk factors of an initial stroke, we have limited understanding of the factors surrounding recurrent strokes,” says Vagal. “We hope by looking at imaging of small and large vessel disease in the brain, we could determine an accurate measure of a patient’s brain health or a predictor of future cerebrovascular events, like stroke or vascular dementia,” says Vagal, whose research is focused primarily on what happens to the brain and blood vessels after an initial stroke. “The development of a clinical prediction tool, incorporating our full range of modern imaging techniques, will enhance our ability to identify patients at a higher risk for recurrent strokes,” says Vagal. “The mentorship of Dr. Khatri has been critical for my career. I have always had incredible support from the radiology department, but to have additional cheerleaders in neurology and the UC Stroke team is an added advantage; it really does feel like my second home,” says Vagal. “It has been incredibly gratifying to mentor Dr. Vagal, to see our radiology department grow its research portfolio and to now partner with her to achieve our synergistic goals. It has also been very rewarding to see our community work together toward better stroke care regionally and nationally,” notes Khatri. Members of the central neuroimaging core include UC neuroradiologists Thomas Tomsick, MD; Mary Gaskill-Shipley, MD; Rebecca Cornelius, MD; and Lily Wang, MD. 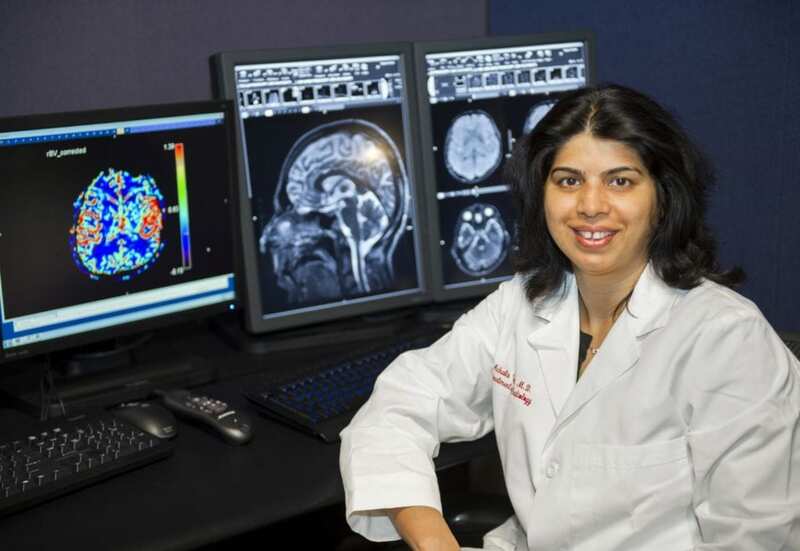 Shantala Gangatirkar will be the imaging coordinator for the study, and the biostatistical core will be housed at Cincinnati Children’s, led by Heidi Sucharew, PhD.